Chinese Materia Medica - Chemistry, Pharmacology and Applications provides comprehensive and up-to-date information on the chemistry and pharmacology of commonly-used Chinese herbs. It gives an in-depth profile of the traditional experience of Chinese materia medica with modern scientific explanations. 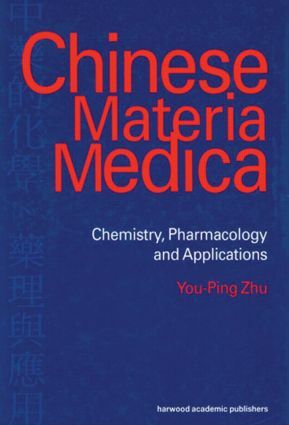 It also features the theories and concepts of Chinese materia medica from the Western medical perspectives, and the sources, production and quality control of Chinese materia medica. This book can be used both as a reference book and a textbook for specialized university and on-the-job training courses. It is essential reading for all students and practitioners of traditional Chinese medicine. It should also be of interest to those in education and research in natural products, pharmaceutical sciences and medicine. Introduction. Characteristics of Chinese Materia Medica. Processing of Chinese Materia Medica. Guidelines for Application of Chinese Materia Medica. Sources and Production of Chinese Materia Medica. Herbs for Relieving Exterior Syndromes. Heat-Clearing Herbs. Purgative Herbs. Herbs Expelling Wind-Dampness. Aromatic and Damp-Resolving Herbs. Herbs Inducing Diuresis and Excreting Dampness. Interior-Warming Herbs. Qi-Regulating Herbs. Digestant Herbs. Herbs that Stop Bleeding. Herbs Promoting Blood Circulation and Dissolving Blood Stasis. Herbs that Resolve Phlegm and Stop Coughing and Wheezing. Herbs Calming the Spirit. Herbs Extinguishing Liver-Wind and Stopping Tremors. Herbs Inducing Resuscitation. Tonifying Herbs. Astringent Herbs.